We recently launched a Fan of the Week campaign on our Facebook page. 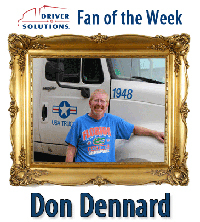 Our first winner was Don Dennard, a solo driver with USA Truck. Don is coming up on his one year mark with USA, so we sat down with him to get a little more information on what his truck driving journey has been like thus far. Keep reading for more information on Don's experience! Q: What were you doing prior to being a truck driver and what made you want to start a truck driving job? A: Well, the economy got to me and I lost a job. I was working at a warehouse, and I’d been unemployed for seven months. I’d done a little truck driving when I first got out of the Navy, back in ’86. Local driving down in Florida, before there were CDLs and all that. I was looking around for work trying to replace the income and there just wasn’t a whole lot out there with the way the economy was. I knew I could make decent money in a truck driving job pretty quickly and I knew it only got better and better as I went along. It wasn’t my first choice to come back out here on the road, but it was the most viable choice for me at the time. A: I googled “truck driver training” online and I almost went with a different company first. In fact, I was almost ready to go to school and some things came to my attention that they’d been a little deceptive about the money that I was going to pay for school and the payback. It turned out it was like a 50% interest rate on this loan I was taking out for three years. I knew nothing about that until the company that gave me the loan called me on the Saturday morning before I was supposed to leave for school. I called the recruiter back up and said never mind. So I got back online and looked, and found Driver Solutions. I called a recruiter and talked to him for a while and told him about the experience I’d just went through and told him I wasn’t too happy. I’d been straight up honest with the guy from the other company, and he pretty much hid the truth. The recruiter I talked to at Driver Solutions was honest and upfront with me and I felt good about it when I got off the phone with him. A year down the road and I can see that he WAS straight up honest with me. A: Truck driving school really is about getting you a CDL license. That’s really what they’re there for. They’re there to give you the basic knowledge and the basic ability you need to pass the CDL skills test and get a CDL license in your pocket. When you get on with a company, your OTR trainer will teach you to actually become a truck driver. C1 did exactly what they needed to get me my license in my pocket and get me hired on with a good company. C1 Little Rock had really good trainers. There were good guys there. I really enjoyed my time there. Q: Can you tell us a little bit about OTR with your company trainer? A: When you get in a truck, especially if you’ve never been in one before, and you’ve got a guy sitting there with you who’s been a truck driver and knows how to drive, you need to listen to him! Keep your mouth shut and your ears open. The only guys that have problems are the ones that won’t listen to their trainers – the ones that try to question what the trainer’s telling them. We had a couple guys that came together and quit together. They put them with three different trainers… you tell me where the problem was. You have to be teachable. You got to humble yourself. You don’t know how to do this or else you wouldn’t be going through all this training. You need to sit back, and be a student, and learn. Q: We get a lot of questions from new drivers wondering what they need to pack for their first time out with their trainer. What advice can you offer on amount of clothes and other things to bring out on the road? A: Well, you can do laundry in every truck stop, but I only paid to do my laundry one time. I usually take about three weeks of clothes on my own. I took about two weeks worth with my trainer. I recommend doing your laundry in a terminal where you don’t have to pay. As for what to take with your trainer – don’t take too much! There are going to be two people on one truck, and it’s your trainer’s truck, not yours. Don’t take a lot, there’s not enough room for much. Stay tuned for more of our interview with Don! In Part 2, we'll talk to Don about life on the road and how his first year with USA Truck is going. And don't forget to like us on Facebook for a chance to win Fan of the Week!